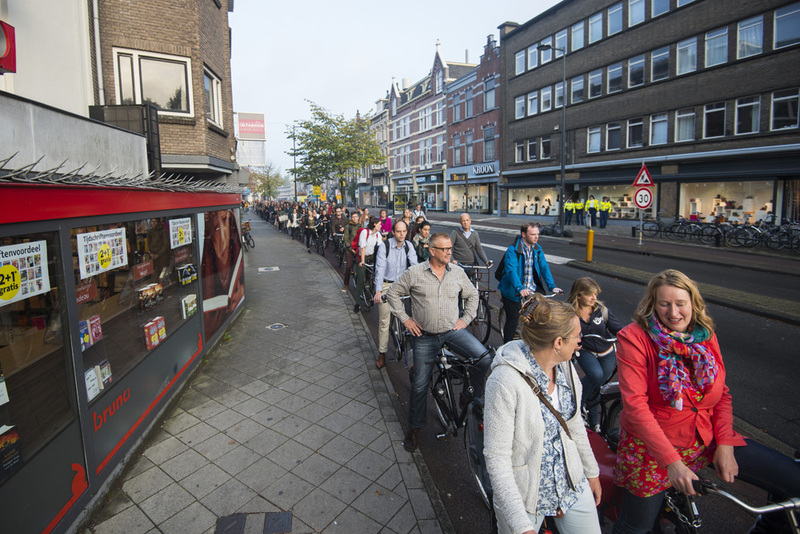 The 2014 bicycle traffic jam in Utrecht caused by a faulty traffic signal. Picture courtesy of DUIC. The Dutch have so far classified traffic in three types, motor traffic, cycling and walking, and they design space for all three in most of their streets (although some ‘unravelling’ of routes is also taking place). However, this system, which worked so well for almost half a century, and which was key to reviving cycling in The Netherlands since the 1970s, is reaching its limitations. 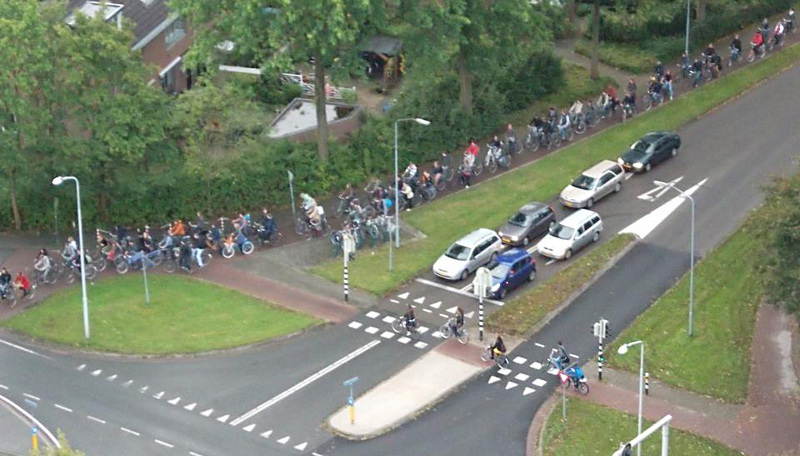 Student bicycle traffic jam in Wageningen (2012), Picture courtesy of Paul van den Akker. After the earlier reports about the busy cycleways, ANWB felt it had to live up to its social responsibility. (ANWB is a travelers’ club. With over four million members – in a country of almost 17 million – it is the largest nonprofit association in the Netherlands to support all modes of travel.) ANWB called on experts from a range of fields and disciplines to help find a solution. They now published a radical proposal for a sustainable solution to this challenge. They found it can indeed not be so simple as widening the cycleways, the total process of urban planning has to be revised. This is how I understood the report. Types of vehicles will be grouped in ‘vehicle families’ based on the mass and width of these vehicles. Types of urban space will be designed for the specific needs of the ‘vehicle family’ which is determined to be the dominant user of that particular urban space. Other ‘vehicle families’ can be guest in that space, but the design of the area will not be changed for their needs. This completely new approach to urban design, titled Verkeer in de Stad (Traffic in the City), was developed for ANWB by four specialized consultancies, Ben Immers Advies, Bart Egeter Advies, Mobycon and Awareness. Key issues to address were the previously mentioned desire to create more space for cycling, but also making sure that walking will be seen as a viable transport option. Another point of concern was that the private car takes up far more space in the built-up areas than it would deserve if you look at the modal share. Lastly, a range of new vehicles have entered public space that do not fit in the traditional order. Think of the high-speed e-bike and the segway, the hoverboard and the type of mobility scooter that looks like a mini-car. Designing city space for the main vehicle user group already exists in some form in the Netherlands. Such as this pedestrian zone where cycling is allowed. Traffic experts from a wide range of disciplines were involved in expert meetings. Several of the Dutch current policies were incorporated in the new system. The mass and speed of vehicles is already taken into account in the Sustainable Safety principles, as is the need for a space to be instantly recognisable. You can also already identify some specific types of urban space, such as the Shared Space zone, the Woonerf (Home zone), the Fietsstraat (Cycle Street) and the pedestrianized city centre. Three cities are involved as pilot-cities to try and test some of the ideas. These pilot-cities are Utrecht, Rotterdam and Helmond. The goal of this design method is to come to a better balance between spatial functions, the quality of the urban space and the mobility in the city. In an ideal world there would be a win-win situation, resulting in better city environments as well as a better flow of all types of traffic. My video in which I try to explain the proposal for a whole new way of designing city space in The Netherlands. Traffic users are to be categorised on the basis of their weight and width in six so-called “traffic families”. Each family consists of vehicles that have a similar weight class and which can be operated within a certain width. Mass is an important risk factor in a crash, so keeping vehicle types apart that are too different will improve safety, especially if you also harmonise the speeds. As explained in the video, these six groups are the following. Group A People Walking. That needs little further explanation. But giving the pedestrian its rightful place in city design can make walking a viable option for a short distance trip. If it is more attractive than taking the bicycle this can lead to a reduction in cycling in the busiest areas. Including a reduction in the number of parked bicycles. Group B People cycling on vehicles with a maximum weight of 35 kilograms and a width of 1.5 metres. This includes for the largest part the ordinary person on a pedal powered two-wheeler going from A to B. Racing cyclists will also be part of this group, as well as most types of bakfietsen (cargobikes) and also the e-bikes. Group C A new type of road user family. The light motorised vehicle up to 350 kilograms with a width of under 2 metres. Mopeds, scooters but also motor bikes! Because most motorcycles are under that weight limit. This means motorbikes will no longer be seen as cars and different laws can influence how both will be treated. Also included in this group are mobility scooters. This means the ones that look like tiny cars will be separated from cycling and grouped with these Light Motor Vehicles. Group E The group of the largest vehicles in the urban area. Buses and Trucks. They have a very different function but their (big) impact on the city environment can be very similar. Group F The group of urban vehicles that have their own tracks. This makes their behaviour more predictable. Think of trams (streetcars if you like). Trains and the metro network are excluded from this classification because they don’t really use the public space in the cities. Categorisation by mass and width is future proof. Any new type of vehicle can be categorised in one of the classes. The second pillar of these new urban design principles is the plan to categorise city space in four types of areas. How such an area is used is one of the leading factors in this classification. The private car is no longer the yardstick of city design. Meaning that speeds in the city are not determined by the vehicles anymore, but rather by how an area of the city is used and by which type of road-user family. It is even important to see how this group moves about. Is that slow or fast and is that in an organised direction or in a more random way. Pedestrians on a square move in a totally different way than cars on a through route. Once you have determined the dominant user you can design such an area for that road user. The speed limits then derive from the space and its design. The reduced differences in speed and mass lead to safer traffic environments. All this would lead to 4 main types of cityscape. The first area is the Pedestrian Zone. The parts of the city where walking is the dominant form of traffic. This can be the shopping area or the place where people go to bars and restaurants. The speed limit is 10 km/h. The second area is the Cycling Zone. Here people cycling are the yardstick. The speed limit is 20 km/h. Sometimes walking and cycling can be mixed. Current cycle streets would fit in this category in that case the light motor vehicles and the cars can be guests. More on how that works later. The third area is the Light Motor Vehicle Zone. The speed limit will be 30km/h. This area can be for mixed use with cycling, and even with the car group. But again car drivers will have to behave as guest. The fourth and last area is the Motor Vehicle Zone. Here the speed is 50km/h. Other user groups can be allowed in this area but in their own space. This goes for pedestrians and cycling. Vehicles of type E and F can share the space designed for type D.
The interesting factor in these categories of vehicle families and cityscapes is that any road user group can always use the space as designed for a vehicle family of one class higher. So walking is possible without specific design alterations in the cycle zone. Cycling can take place in the Light Motor Vehicle zone et cetera (See the design schematics for a clear explanation). Road users can also be allowed to use a space designed for a lower category, but that area will then also not be altered for their specific needs. Think of cars using the cycle space in Fietsstraten (Cycle streets). They remain designed for the bicycle family, but cars may use that space if they also observe the speed limit of (then) 20km/h (now 30km/h). That there will be a speed limit for the cycling area is completely new. Because the racing cyclist and the fast e-bikes are part of the “cycling family” it means they too will no longer be allowed to go faster than 20km/h (in the cycle zone). Again, because reducing speed differences leads to a safer city traffic environment. 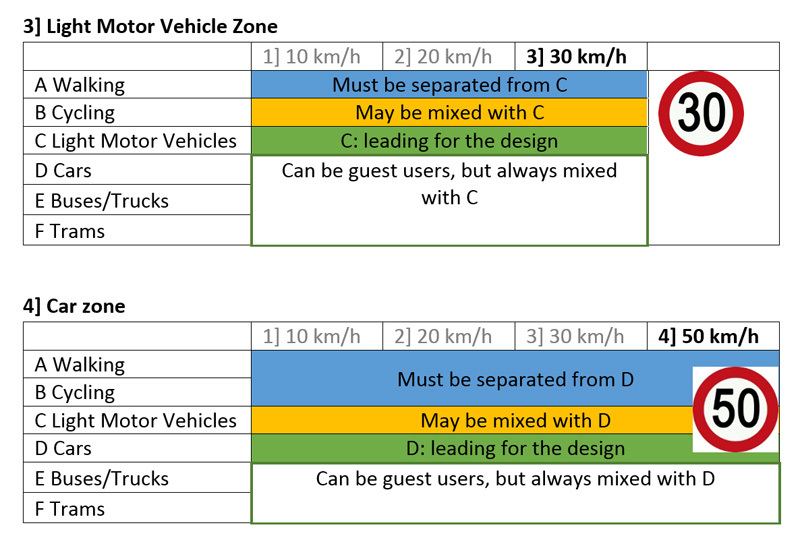 Design schematic for Zones 1 and 2 and how the 6 categories of vehicle families can use these two zones. These different cityscapes will have to be connected in a traffic structure to be accessible. Not necessarily in a separate network for each road user family (some mixing is possible after all) but it must be possible for each road user group to reach their specific areas safely. Design schematic for Zones 3 and 4 and how the 6 categories of vehicle families can use these two zones. It will be interesting to follow the upcoming real-life tests in the pilot cities and to study the results. I feel this planning tool has a great potential in the Dutch situation where trial and error are traditionally part of the urban design process. In this case too, many details have yet to be determined, but this design approach may indeed lead to cities designed in a smarter way. It may also put an end to the crowded cycleways, the motive to come to this design approach in the first place. I am surprised at the reactions here to this, and cannot work out what it is that is causing this harrumphing, although it feels it might be around vc assumptions that are based on a misunderstanding of equality! It seems to be a logical proposal that if something is being shared, the more powerful party is strictly controlled, for example by speed limits and being a guest in an area that belongs to a weaker travel family. In the disability world, that is known as reasonable adjustment – do something to favour the weaker, in contrast to the vc attitude that seems to believe the 3 year old by herself on her trike is equal to the HGV skip driver. This appears to be a response to several complaints about the Dutch bikeway system. One problem is the rigid allocation of space between motor vehicles and bicycles. Another is the inclusion of light motorcycles in the class of bicycles. I don’t care what the Dutch do; that’s their problem to be solved in their own way. But I do care about Dutch ideas recommended for adoption in the USA, where I cycle. The most important ideas in this proposal create four different urban zones: Walking, Cycling, Light motor vehicles, Cars. The plan recognizes that heavier and faster vehicles may have to be used in areas intended for lighter and slower vehicles. This would be for waste removal, delivery of construction materials, moving of household goods, and the like. But the vehicles used for such services would have no right of way, would have to be driven as “guests”. Now look at the results, for cyclists who, in the USA, obey the rules of the road for drivers of vehicles. They could use Walking zones, but would have to act like pedestrians. Not a very useful procedure, but acceptable when necessary. Cyclists can use the Cycling zones, but pedestrians are also allowed. One cannot expect pedestrians to obey the rules of the road; cycling among such pedestrians is among the most dangerous of cycling activities. Cyclists may use the Light Motor Vehicle Zone. There is no indication of the rules of the road that apply in such zones, but one has to assume that these will be similar to the rules of the road for drivers of vehicles. Cyclists are prohibited from Car Zones. So, it is only in the zones for light motor vehicles that cyclists would receive a fair deal, and these are limited to 30 kph (about 20 mph), less than many cyclists would like to use. Nothing here useful for vehicular cyclists. The cycle paths are ordinarily very good, and you can ordinarily cycle past them at a high speed. And when the sheer volume of cyclists is lower, then you can indeed cycle faster. It’s the same with car congestion. Too many cars, and the speed lowers. Also note that the fast majority of cyclists here are not wanting to vehicular cycle, or at least not ride like a car anywhere other than a low volume 30 km/h zone where they would do that anyway. Why would you consider the 1% maybe of greater importance than the vast majority of people riding for utilitarian purposes? It looks like you wish for a fietsstraat here, or at least what would be the end result of your description of the ideal here. If there is a low enough volume and speed of motor vehicles, then that can work quite well. If there is too many motor vehicles, or they go too fast, then it is needed to separate. The end result of such “rigid” allocation of space is that people are safer. A car cannot be allowed to go on a cycle path at 50 km/h, or even just 40. That would be quite dangerous. Only the types of traffic with similar enough characteristics are combined. At 30 km/h speeds and very low numbers, and therefore masses, of motor vehicles are they allowed to mix in urban areas with cyclists. Or less speed sometimes. Cyclists do not have their main routes routed through pedestrianized streets. They have their own separate paths on their main routes, or they share on fietsstraaten, only sharing with cars, not pedestrians. 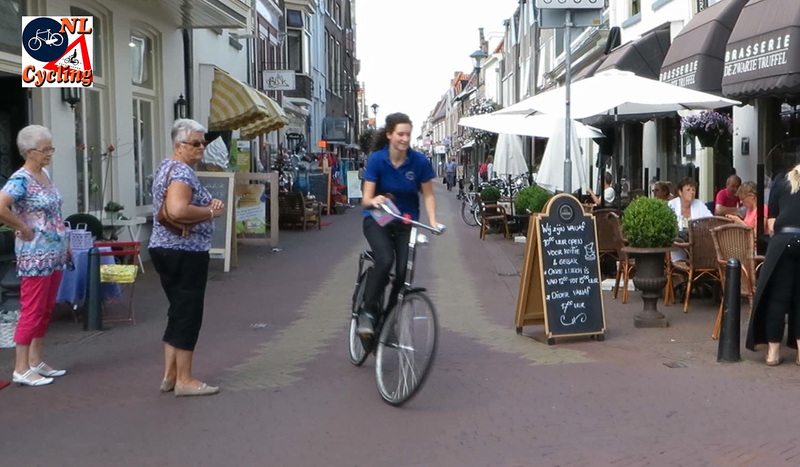 Pedestrianized streets (and woonerven) are local access routes. Do I have to say it again and again? I don’t give a damn what the Dutch do, that’s their problem to solve in their own way. I care about the advice transferred to USA cyclists, and the advice copied by American cyclists from Dutch sources. But the only advice I have ever received from Dutchmen is that Americans should cycle in the Dutch way. So far as bicycle transportation is concerned, the two situations could not really be more different than these. The cities and histories are so different that the advice from one doesn’t fit the other. So I so state in these discussions, but apparently uselessly. Without you, America and probably Australia, Canada and Britain would have been much more likely to develop the kind of paths the Dutch have. Not every American wants to ride like the vehicular cyclists do now. And even some vehicular cyclists do it not because they want to, but because they have to. They don’t have the option of using a bicycle path because they often don’t exist. I have to do the same. If you are in the Netherlands, and you don’t want to ride a fiets, or upright bicycle, then you are perfectly free to pick another kind of bicycle, including the kind with the thin wheels, light weight and dropped handlebars. You an also pick a recumbent, or you could pick a velomobile. In fact, using these kinds of bicycles leads to faster journeys than most American trips would be. Fewer traffic lights, fewer stop, usually only yields, larger corner radii. Direct routes on a finer grid of routes. The police and public not hounding you if you do even the smallest mistake. You can even lock your bicycle faster because of the ring locks. Also don’t underestimate how much pleasant conditions make longer journeys seem shorter. And of course, most people do ride upright bicycles because of their sheer practicality, and given the right conditions to cycle in and the bicycles that are upright to ride, most people would pick the latter, even in the US. They certainly did when their journeys were more utilitarian in the 1900s. It’s not forced on them, it’s just a choice. I could buy a racecar if I wanted to, but most people would get an ordinary sedan or something like that because they are the kind that are practical for everyday journeys. At least as practical as cars can be. I actually want to get a real opafiets because I know very well that it is so practical, I only have the hybrid I have because my dad saw a sale on those bicycles at a store and with only a couple days left in the sale, and that he didn’t let me chose a different store. Not forced on me, in fact I would probably be forced the other way, but because at least sidewalk riding is decently well tolerated in my city and I do have the guts, I will be able to ride slightly slower. After eighty years of US governmental and societal effort to frighten cyclists off the roads and to prohibit them from gaining competence, it is no wonder that some cyclists choose to do what they have been told to do lest they be killed. The remarkable thing is that some US cyclists have consistently refused to be frightened by government and society into cycling in the way that Motordom hopes will make motoring more convenient. The American cycling situation is so different from the Dutch experience that Dutch people just cannot understand it. That is the only reasonable conclusion to be drawn from years of conversations about cycling that have led to nowhere. Do you know how ridiculous you sound? It doesn’t take the Government to scare people off, cars travelling at 30mph will do it just fine. 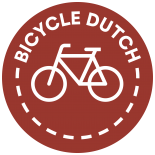 “The American cycling situation is so different from the Dutch experience that Dutch people just cannot understand it. That is the only reasonable conclusion to be drawn from years of conversations about cycling that have led to nowhere.” Thanks to you. The Government only listened to you because you provided them with a convenient excuse as to why they shouldn’t do anything. Face it: you lost, your ideas are a dying breed. The Dutch have cycling levels several times better than the US and a safer record too. This has reduced the number of car journeys, unlike the US. Will you visit the Netherlands already? You are a shockingly stupid individual. Really, it’s quite something that someone could be so incredibly obtuse. Of course the American cycling situation, in general, is quite different. However you seem to lack any sort of understanding of WHY it is different. It is different because cycling in the US is seen as a sporting activity engaged in by a weird subculture of leg-shaving Lycra fetishists, or something for children. In the Netherlands, it’s seen as a normal means of transport, not a recreational or sporting activity and not the mark of a weird subculture or something requiring a lot of expensive specialist gear. The reason for that? Infrastructure. Your painful idiocies about “vehicular cycling” are part of the problem. More cyclists on roads designed for cars doesn’t lead to greater cycling competence, it generally leads to fewer cyclists and the marginalisation of cycling as an extreme activity that only a minor subculture participate in. The entire concept is a bad one and should just go away; it has no place in conversations about sustainable transport infrastructure in modern cities. CJH claims that Americans have a negative view of cycling because they do not see cycling as a normal means of transportation but instead the sport of a fringe group or an activity for children. CJH is just plain ignorant of American history. Maybe he needs to look up Henry Ford, who at one time was the builder of, I think, two thirds of the cars in the world. I suggest that America never considered cycling to be a normal mode of transportation. Certainly, in 1925 Motordom started a campaign to frighten cyclists off the roads, as it had previously managed to frighten pedestrians off the roads. Certainly, in 1944 the recommended American traffic law made cyclists subservient to motorists. I myself remember American cycling back to 1940, and at that time cycling was not considered a normal mode of transportation. Most Americans got along without bicycle transportation because they had little use for it; New York and Boston had subways and elsewhere motoring was so available that most Americans never felt the need to cycle for transportation. Therefore, cycling was left to children, the only officially recognized cyclists, and to fringe people such as myself. America’s dislike of cyclists was created by Motordom’s campaign to denigrate cyclists and get them off the roads, and that is the legacy that American cyclists have to live with. Sorry for your argument, there, but I happen to be an American who is quite aware of US history (and am also aware of how cycling infrastructure is implemented in other countries, because, unlike you, I’ve actually cycled in the Netherlands), and I have to say that “vehicular cycling” is a failure and the lack of provision of cycling infrastructure is as responsible for the lack of transport cycling, even in urban areas, as “car culture” or “Motordom”. CJH answered my description of American anti-cyclist policy by claiming to be fully aware of US history regarding cycling. Since he did not disagree, he considers my description to be accurate. He then claims that “”vehicular cycling” is a failure”, for which he provides no evidence. My own statement proves CJH wrong, for it stated that vehicular cycling exists because it is so much better than the cyclist-inferiority cycling created by Motordom and attempted to be enforced by government. But despite claiming to know US cycling history, CJH says nothing about correcting this governmental and social anti-cyclist inequity; he accepts it. Next, CJH bases his argument on the assumption that in the USA there is a transportationally significant demand for bicycle transportation, repressed only by the lack of bikeways. There is precious little evidence for this claim. If there were such a demand, surely there would be significant numbers of transportation cyclists already. As I wrote, Americans never had much use for bicycle transportation; they lived quite happily without it. Lastly, CJH states that he prefers the Dutch system, implying that America would greatly benefit by importing the Dutch system. But CJH claims that only importing Dutch bikeways would produce those benefits. But that doesn’t work well. Importing Dutch bikeways as seen through the anti-cyclist, cyclist-inferiority eyes of American society produces sadly defective products more akin to the anti-cyclist program of American Motordom than to the Dutch system as a whole. The completely different histories of the two societies, from medieval cities to the present, make them incompatible. In truth, accepting CJH’s argument amounts to recommending that Americans bow down to American Motordom’s demands for cyclist inferiority. You might wonder why it’s so useless. Has it occurred to you that you might have been wrong for decades? You claim that I sound ridiculous. Well, your claims show you to be ridiculously ignorant. 30 mph cars are not frightening; they frighten you because you have been trained by using fear. You claim that “The Government” (presumably USA) has followed my recommendations. Well, it did once, only once. I got it to grant cyclists riding on sidewalks and crosswalks the rights and duties of pedestrians. In all other respects, for forty years I have been fighting governments’ anti-cyclist oppression, and you can see for yourself that there have been no significant victories. You claim that my ideas are a dying breed. Well, they have survived seventy years of Motordom’s and governments’ program of forcing fearful and incompetent cycling upon us, and when vehicular cyclists use what government tries to require us to use, whether pure US or Dutch transmitted by US theory, the results are worse than obeying the rules of the road for drivers of vehicles. We can recognize what’s best for us; that’s the proof of the vehicular cycling practice. If government really wanted to encourage bicycle transportation, it would continue facilitating frightened and incompetent cycling, but it would also cease trying to prohibit competent and useful cycling done in accordance with the rules of the road. America has had seventy years of legally attempting to prohibit safe and useful cycling in accordance with the rules of the road for drivers of vehicles, and the persistence of vehicular cycling despite all the forces against it demonstrates its value. The anti-cyclist traffic laws must be repealed. 1500 kg car traveling at 50 km/h near a 25 km/h 100 kg cyclist, including the bicycle, means that there is a force of 144 kJ acting upon a cyclist. I’d call that pretty scary. I also found in the news that a small boy was hit by a car going 50, and is in the hospital with many internal organ injuries. What kind of sane parent would support vehicular cycling for anyone, let alone a small boy? Even in the 30 km/h zones where it would only be 30 km/h, these 30 km/h zones are effective because there are hardly any cars moving at all. What do you mean prohibiting the competent and useful cycling? If you mean making cyclists use narrow and badly designed sidepaths instead of roads then you have a point. But Dutch cycle paths, being well designed, with a high design speed and efficient, wide, with priority at most side streets, clear, and easy to use, then there is no need of riding on the road, and nobody in the Netherlands advocates for cycling on the road, even by racers. Perhaps the idea of dying breed is meaning that you are soon going to be dead John. I don’t know when you’d expire, your cycling is making you stronger than most other people around, but I think they are trying to create the idea that vehicular cycling is not as popular an idea given how many things like protected intersections are popping up in the US and Canada. Vancouver has a nice protected intersection, Burrard and Cornwall. Why not go and see some replicas of Dutch cycle infrastructure for yourself? You must be insane if you think people have been trained to react like this. You may not be frightened of very fast moving massive vehicles but the vast majority of people are and this is due to millions of years of evolution. It is similar to saying people aren’t afraid of heights but have been trained to be so. Here in the UK, the Government does has done nothing to make people frightened of motor vehicles. It provides cycling training (similar to the type you advocate) and constantly admonish people to cycle yet the results are pitiful, just like the US and every other country that does not provide infrastructure. “In all other respects, for forty years I have been fighting governments’ anti-cyclist oppression, and you can see for yourself that there have been no significant victories.” Well you have helped the US achieve its anti-cycling status by rejecting cycling infrastructure which is the only thing that could have saved it. “Well, they have survived seventy years of Motordom’s and governments’ program of forcing fearful and incompetent cycling upon us, and when vehicular cyclists use what government tries to require us to use, whether pure US or Dutch transmitted by US theory, the results are worse than obeying the rules of the road for drivers of vehicles. We can recognize what’s best for us; that’s the proof of the vehicular cycling practice.” There will always be the 1-2% who cycle amongst traffic. However, I meant in terms of cycle campaigning. There is a long history of this share the road nonsense and those who spout it are being useful idiots to the motor lobby and Governments who do not want to act. As I said, the Netherlands have achieved results the US can only dream of, and never in a million years will the solutions you advocate allow that kind of level of cycling. They produced results, the US hasn’t. I ask again: why don’t you at least once visit a Dutch city like Utrecht to see for yourself what they have achieved. And of course don’t forget the other two problems with tyrannosaurus training, they can be very grumpy and theey probably did not see you. Both of these studies you cite make for fascinating reading. I especially like the one about why drivers do not see cyclists. One factor though seems to be missing in the second study. I believe that if drivers are in a hurry, then when they come to a stop sign they are instinctively looking for an opening so they can pull out and get going on their trip home. They are thus motivated to see an opening and to not see items like bicycles, Since the latter may serve to slow them down. Why not have a nice little cycling tour in the Netherlands before you start commenting so negatively about it’s cycle paths? See for yourself whether it is difficult to ride around at the speed at which you desire? Do remember that if there is bicycle congestion, that there is also lots of congestion on the roads in the US, so go ride around during maybe 1:30 PM when most people are still at work or school so you get the non congested effect. You constantly claim that vehicular cycling is the way but you’ve never tried it any other way in a place where other ways are safe and accepted by society. I have repeatedly written that the Dutch have a cycling system that suits them in their society with its long history. American society, particularly as regards cycling, has an entirely different society and history. Trying to import bits of Dutch bikeways into American highway society produces facilities that simply amplify American anti-cyclist attitudes and laws. Your argument based on long history and American exceptionalism seems to be contradicted by recent history. See http://www.bikeleague.org/sites/default/files/2012_ACS.xlsx for example. Bike infrastructure (of varying quality) goes in, and contrary to your predictions ride share goes up, and contrary to your predictions safety per rider also goes up. No new anti-cyclist laws appear in the places where the infrastructure has gone in; instead, Idaho-stop is now receiving serious discussion in places like San Francisco, and in Massachusetts a few years ago there was a successful attempt to normalize (make less hostile, generally) bicycle laws. And if you ride in this stuff, you suddenly begin to see how safety in numbers might actually work. It’s not some mystical change in the zeitgeist, it’s instead that a continuous stream of bicycles works to remind the driver about to open the door that there might be another bike like the one that just road past, or the guy pulling in from a side street that sees one ride by as he’s approaching, that there might be another one after that. And so on for right hooks. My ride home, we get that, even this time of year (lows around freezing). Summertime it gets crowded. And Special as we Americans are, we still manage to drive 230 Billion miles per year in trips 5 miles or shorter ( https://dr2chase.wordpress.com/2014/04/09/short-trips-in-cars/ ) or about 720 miles per person-year. Could be more, but it’s not nothing. Median density in the US is about 1300/square mile, 33%ile is about 2800/square mile (see https://dr2chase.wordpress.com/2013/06/18/updated-cumulative-population-by-density-2010-census/ for sources, spreadsheets, pretty graph ), so we actually have a population for which this might apply — note also that Massachusetts is smaller and more populous than Denmark, and NYC metro area is smaller and more populous than the Netherlands. If, as was done in America, you raise nine decades of people to be frightened to death of same-direction motor traffic, naturally when you install facilities designed to reduce that fear, you get an increase in cycling. I repeat, the psychological effect is reduction of fear, an action that has nothing to do with reducing car-bike collisions. You quote statistics collected, and instigated, by America’s foremost proponent of cyclist-inferiority cycling, and the most that you can find in any cities is a miserable 0.3% commuting share. As I have been writing all along, Americans don’t need bicycle transportation, as shown by the fact that for the past ninety years their use of it has been minuscule. As I have written repeatedly, the best and safest way to cycle in America is to obey the rules of the road for drivers of vehicles, an action which requires disobeying the anti-cyclist, cyclist-inferiority traffic laws. 0.3% is flat wrong in 2012. For the entire US, good, bad, and ugly, we get 0.6%, in commuting stats from The League of American Bicyclists, formerly known as the League of American Wheelman, and they got their data from the US Census and the American Community Survey. The LAB/LAW has been around for a while; presumably they know as much about bicycling history as you do, and if they have changed their views over time perhaps there is a reason. To imply that the Census and the ACS would skew their numbers to favor a request from the LAB is more than a little nutty. If you actually look at large cities (the spreadsheet that you obviously didn’t look at contains figures for the 70 largest) you get 1.16%. So-called “bicycle friendly” communities get you to an average of 1.48% (not clear this is a meaningful statistic, since the BFC designation could involve some political circularity with the ride share). Looking for cities with largest ride share, we get numbers well better than 1% — 6% in Portland, 4.5 in Minneapolis, 4% in Washington and Seattle, 3.8% in nice, flat San Francisco, 8 more with 2% or better, including Boston (adjacent to where I work, and actually not that friendly). In Cambridge, where I work, the ACS numbers for 2009-2011 give a 7% commute share for bicycles. Traffic Counters show a tripling in the rush hour count between 2002 and 2012. Cambridge (and adjacent Somerville) are definitely putting in infrastructure, some of it good, some of it bad, but it is nonetheless attracting people. It would be extremely helpful if you could cite statistics to support your claims, preferably ultimately sourced back to some reliable government agency, even better if it is available over the net. It was looking at stats like these that convinced me that Vehicular Cycling was the wrong way to go — decades of failure to move the needle on ride share ought to tell you something, especially when changing the experiment produced better results in just a few years. And note also that your view of “safety” is focused only on crashes. Not exercising is deadly — stats from Finland, Denmark, and China all suggest that not-bicycling to work increases your annual mortality risk by about 20% or more (table 1.2, here http://www.keepeek.com/Digital-Asset-Management/oecd/transport/cycling-health-and-safety_9789282105955-en#page44 ). (The crash-risk contribution is I think 4-5% in the US.) Discouraging bike use with unpopular “safety” rituals leads to an overall net increase in early deaths — i.e., you have almost certainly killed a few people with your blinkered-on-crashes safety advice. Harsh, but follow the numbers. By-the-way, since you’re the self-proclaimed cycling safety expert, I assume you have daytime running lights on your bicycle, right? There’s been studies of that, too (scroll through that OECD document — “The number of related crashes (crashes in daylight and with a counterpart) decreased by 50% approximately. Both results are statistically significant.”). I quoted from the statistics that were chosen to present. Yes, I thought that 0.3% was low, but I wasn’t going to claim that the chosen statistics were wrong, since they came from America’s premier advocate of bicycle transportation volume, the LAB. I made no claim that LAB had skewed the statistics. I simply used the LAB’s statistics that were presented. You claim that my use of cycling crash statistics is incorrect since I do not consider the health benefits of cycling. Your claim is just plain wrong. In considering the safety of two different styles of cycling, which is what I do, the health benefits are irrelevant unless the two different styles produce different health benefits. And for this discussion I make the strong suggestion that vehicular cycling produces greater health benefits than does slow cyclist-inferiority cycling. You state that your choice of the Motordom-invented cyclist-inferiority cycling system was made on the basis purely of cycling volume. Raise a society frightened of same-direction motor traffic and imbued with motorist superiority; then, when you start providing facilities designed for the frightened and incompetent, you collect some more cyclists. That doesn’t mean that your system is safer or better; it only means that it is less frightening. My choice of vehicular cycling over cyclist-inferiority cycling is not based on cyclist volume; it is based on the welfare of cyclists. Cyclists fare best when they act and are treated as drivers of vehicles. Your dismissal of the health effects of cycling depends on keeping the number of cyclists constant — and vehicular cycling excels at that, we have decades of pre-infrastructure data to show that this is true. That is, however, the entire problem with vehicular cycling — it excels at keeping the number of cyclists at a (very low) constant. Compared with what is clearly possible (what has already been demonstrated in US cities that have made the effort to increase cycling share) that leads to a net increase in early deaths. If you could include a link to whatever stats you are referring to, that would be ever so helpful, because there are many, many replies here. I’d also like to know why yopu think they are more likely to be correct than the ones from the LAB, and on what source data the stats that you cite are based (notice how I did this). You’re playing a silly debating game here, I’m trying to figure out what’s actually going on and make it better. Let’s get this straight. In this discussion I have made no statistical claims. Somebody presented a spread sheet purportedly from LAB showing, for some US cities, the proportion of cyclists among all commuters, arranged in order of decreasing proportion. The highest numbers shown were 0.3%. I remarked on that. dr2chase criticized these statistics, saying the values should be larger. Now dr2chase is arguing that I have not presented “a link to whatever stats [I am] referring to”. Since I never presented any statistical information in this discussion, dr2chase is rather ill informed. There are a lot of comments here, but it sounds like you’re describing the spreadsheet I provided, except for the numbers. I provided a link to statistics. It is the “70 largest cities spreadsheet” from the LAB, originally sourced from Census and ACS. That is what I quoted from. The largest ride share numbers there are well larger than 0.3% and they have increased notably in recent years. From this I infer that infrastructure seems to help, and increasing ride share seems to produce safety in numbers. I don’t think that history is destiny, and I don’t think that the US is that special, and we’re certainly not homogenous — meaning that we aren’t necessarily a single value of special even if we are special, and I conclude all of this from looking at numbers, because we can argue forever about interpretations of history. In our larger cities infrastructure seems to work better than Vehicular Cycling. The exceptions seem to be in the humid South; I’d be much more willing to believe that humidity is destiny. And, once you see that we’re not special and that we can boost our cycling ride share with infrastructure and that safety in numbers works, any city planner or rational government official would want more of it; bikes take up far less room when parked, are quieter, can move more people on smaller roads, and are safer for pedestrians. The main problem that comes afterwards is that of course they try to do it as cheaply as possible, and nobody’s quite sure what works best in the US (built infrastructure isn’t destiny, but it’s expensive to change wholesale) and we find ourselves frequently at odds with boneheaded guidelines from AASHTO. dr2chase is quite open about his motive. He wants some motorists to switch a transportationally significant number of trips from motor to bicycle transport. His only comparisons compare motoring to cycling. To accomplish this, he advocates that government build bikeways that appeal to frightened, ignorant, and traffic-incompetent cyclists, who respond in the belief that bikeways make cycling safe. This belief is illusion, because bikeways have never been designed to reduce car-bike collisions. Bikeway advocates have never attempted to demonstrate how bikeways reduce car-bike collisions. All that they have done is to rely on reducing fear of such collisions, without actually working to reduce them. To my knowledge, there has never been an accepted engineering analysis, based upon the statistics of car-bike collisions, that demonstrated that bikeway design is intended to reduce car-bike collisions. Indeed, when such analysis has been done, it shows that bikeways are more likely to increase car-bike collisions than to reduce them. The original AASHTO bikeway designs were created by Motordom with the purpose of making motoring more convenient. That’s historic fact. And I forced AASHTO to recommend against its originally desired sidepaths, because they create so many more car-bike collision situations. That’s why dr2chase complains about AASHTO bikeway designs. He favors the NACTO designs, which exactly contradict AASHTO by recommending dangerous sidepaths. It is not too much to state that dr2chase advocates an anti-motoring social-engineering scheme that is conducted without regard to, and indeed by concealing, the welfare of the cyclists who do the work. Vehicular cycling is the direct opposite, in that its only concern is the welfare of cyclists. It is opposed by both Motordom, with its ideology of motorist superiority, and by anti-motoring, with its ideology of cyclist inferiority. Vehicular cycling considers each cyclist as being the legal and social equal of each motorist. In the USA, for the convenience of motorists, Motordom enacted traffic laws making cyclists subordinate to motorists. Vehicular cyclists oppose those laws, and vehicular cycling and vehicular cyclists still exist, despite Motordom’s and governments’ attempt to stamp out vehicular cycling, because those who have learned vehicular cycling discover that it is far better than any of the other choices. Imputing motive and ad hominem is a poor substitute for argument based on statistics. And do you honestly think that decades of government support for highway building and sprawled housing patterns was not also social engineering? Dr2chase appears to have very little understanding of what he advocates. His last message contains two very large errors. First, he claims that statistics prove his argument. Yes, they do. When three generations of Americans are raised by first Motordom and then by government to be frightened, ignorant and traffic incompetent cyclists, then providing the bikeways that such persons desire tends to increase cyclist volume. The issue concerns not the number of bicycle riders but whether that is a good policy. It is not good for cyclists. Some American cyclists have always known that obeying the rules of the road for drivers of vehicles is better for them than either what Motordom desires or government requires, and that number now appears to be increasing. Dr2chase’s second error is that he denies any error by claiming that modern American urban development is produced by motives as ideological as his advocacy. Americans need housing and roads. These are provided as people are prepared to pay for them, partly through profit and partly through political action. Of course this has social consequences, but this is not driven by ideology. It just happens, and it is not social engineering. But dr2chase’s advocacy is done to suit his ideology; he doesn’t care about the welfare of the cyclists attracted by his advocacy; he cares only that some trips are switched from motoring to bicycling. The use of people to carry out an ideology is social engineering. And, finally, dr2chase plays the ad hominem card. Well, yes of course, when ideologies and ideological motives are at the heart of the discussion, then they have to be discussed. You are wrong (deluded, crazy) if you think you know my own mind better than I do. Stats suggest that infrastructure, perhaps by leveraging safety-in-numbers, yields safer cycling that what we had before, which was the result of teaching VC as best we were able: http://www.nyc.gov/html/dot/html/bicyclists/bikestats.shtml . That’s safer cycling for cyclists, right there in that graph, and that’s what I want. The policies you advocate did not work as well — they make cycling uncomfortable and unpopular, and hence deprive us of the benefits from safety-in-numbers. There is the additional benefit of delivering better health to all the people who might choose to ride a bike if they felt comfortable doing it. Riding a bike “badly” is better than not biking at all. And again, if you think you know my mind better than I do, then you are crazy. I was a Vehicular Cyclist for decades, and the stats changed my mind. I think it’s interesting that you choose to support your position appeals to culture and history, instead of actual safety statistics, especially recent safety statistics that show the influence of cycling-specific infrastructure in this country. Why don’t you cite more recent safety statistics to support your position? Surely you, as someone who cares so much about safety, keeps up with this literature, right? Dr2chase demonstrates even more strongly his ignorance of the subject that he chooses to discuss. He has not shown, because he cannot, that bikeways are designed to reduce car-bike collisions. He presents only two statistics: installation of bikeways increases the number of cyclists; the increase in the number of cyclists has been accompanied by a decrease in the car-bike collision rate per cyclist. It is perfectly reasonable that all the hubbub about bicycle transportation would produce such a result, but nobody knows how or why this process occurs. Those who have attempted to produce a numerical relationship have been deluded by a simple arithmetical law; there is no science behind that. Dr2chase claims that “[he] was a Vehicular Cyclist for decades, and the stats changed [his] mind.” Well, dr, support your claim, for example by informing us of whose examination you passed and your score. I suspect that you passed no such examination, but your statement produces many more suspicions about your claims. Dr2chase claims that the statistics, presumably of the popularity of bikeways, persuaded him to give up VC. This is a very strange claim. People who have discovered the advantages of VC cycling simply don’t give it up to copy the multitude of frightened, cyclist-inferiority, traffic-incompetent people who ride in the cyclist-inferiority manner on bikeways. In short, I strongly suggest that dr2chase is falsifying the facts when he claims to have been a Vehicular Cyclist. Dr2chase further demonstrates his ignorance with the claim that “the policies [I] advocate did not work as well — they make cycling uncomfortable and unpopular …” Well, in a very small way I do express a policy: ‘Cyclists fare best when they act and are treated as drivers of vehicles'”. When implemented in the minds of cyclists, that policy makes cyclists happier, more confident, and much more capable in traffic. You see, the policies that dr2chase is complaining about, that make cycling uncomfortable and unpopular, are those created by Motordom seventy years ago and later enforced by government, for the purpose of making motoring more convenient. In short, dr2chase is so ignorant about American cycling that he believes that the policies making cyclists frightened and subservient to motorists are my policies, when in fact they are the policies that I have always fought against. Dr2chase’s errors about Vehicular Cycling demonstrate that he has no knowledge of VC and, without such knowledge, can never have been cycling in the VC manner. Dr2chase is just another example of the host of ideological bike advocates whose anti-motoring ideology has twisted their minds into an anti-cyclist advocacy. Indeed, I am no true Scotsman. PS and if the cause was bicycling hubbub, that was some mighty Effective Hubbub. Much more powerful and fast-acting than VC ever was. Dr2chase argues that the present governmental and social hubbub about bikeway cycling is “Much more powerful and fast-acting than VC ever was.” Fast acting? It took ninety years for Motordom and forty years for government to achieve the present state of bikeway advocacy and use. I would not call that fast. But Vehicular Cycling has persisted, supported only by the cyclists who do it, and despite the efforts of Motordom and government to stamp it out by fear and legal jeopardy. And consider this, which is the better program for cyclists, that which is done by cyclists because they have found it best, or that which is built on Motordom’s and governments’ policy of frightening cyclists off the roads, of deliberate traffic-incompetence of cyclists, and of legal jeopardy for cycling safely and according to the normal rules of the road? It is easy to see that Vehicular Cycling is best for those who do it. So john, I have some simple questions: Which country has more cycling, the US or the Netherlands? What are the most common bicycles used in each country? Have you even ever visited the Netherlands and rode a bicycle around? In which country is it more pleasant to an average joe to ride around? In which country are young children commonly seen riding bicycles to everyday destinations even without helmets or high viz or parent/guardians? The Dutch have a long history, about a century, of useful bicycle transportation. Americans have a history, not quite as long, of being trained by Motordom and by government to have a phobia about bicycle transportation. The two nations have had completely different histories, going back for the Dutch into medieval times. It is just plain useless to try to obtain useful information by quoting from one to the other. I was somewhat curious to see how resistant to data he might really be. The style of argument that emerged from him was indeed disappointing. And I’ve given up. I do in fact use vehicular tactics all the time — they’re a nice coping strategy for bad drivers on bad roads. My favorite trick is obeying the law as obnoxiously as possible — with a fast rolling dismount, you can often make up a little time converting to a pedestrian for an all-ways walk, or walk across the top of a T that has a red light, and then keep going. Don’t stop replying. It makes John think he’s right, which he isn’t. Your claim that I refuse to accept the statistics that you present is just plain wrong. Just try to point out an occasion in which I have stated that the statistics you have presented are inaccurate. I have not done so. You claim that the statistics you present show that the bikeway program is sufficiently popular to increase cycling volume. I have always agreed that they do. Then, by advocating what the public wants, you argue that what the public wants is so good that government should do more of it. That is where we differ, and some of you do also. You are subordinating your judgment about cycling to that of the public, which in cycling affairs has been raised to be frightened, subservient to motorists, ignorant, and traffic-incompetent. In doing so, you are advocating a system invented by Motordom and enforced by government with the intent of making motoring more convenient. That’s the nasty result that your worship of the statistics of popularity produces. And, look at Midtoad’s film of him cycling to work. Despite his presumed advocacy of inconvenient subservient bikeway cycling, he uses vehicular cycling for himself. Why yes, John, I did use vehicular cycling techniques, maybe because I am one of the tiny percentage of the population that could be characterized as a “fearless and confident” cyclist. But very few people in the general population will accept to ride the way I did in that video. One little mistake, and I will be run over. Even I find it much more relaxing to cycle to work on a riverside pathway, or a protected cycle track. And that is not because I have been conditioned by motordom to be fearful, nor do I believe there is a vast conspiracy to keep me off the road. What I do understand is that a bicycle riding with motor traffic is like a mouse running with elephants. Even if all the elephants are respectful and considerate, it only takes a tiny slip and the mouse will be squished. It is simple physics. While I will steadfastly argue for the privilege to ride my bike on any road, in practice I prefer to stay away as much as possible from motor traffic, especially in this new age of distracted drivers talking on a cell phone or texting. Physically separating bikes and cars in space reduces exposure and potential points of conflict. On a shared roadway I can physically get struck by a speeding/drunk/careless/inattentive driver at any point. If there is a barrier separating me physically from cars, potential points of conflict are reduced to driveways and intersections. Intersections are predictable, we know there is a chance of conflict there, unlike a shared roadway where there is potential for conflict at any point. If those intersection conflict points are designed in a manner that can separate bikes and cars in time and/or require cars to slow down, the situation is made safer and more predictable to minimize likelihood of conflict between the two modes. It is for a similar reason that pedestrians only need to be concerned about cars at driveways and intersections. Now most pedestrian crashes happen at intersections, but I am not about to advocate for vehicular walking and the removal of sidewalks. Instead I will advocate for measures that make intersections safer for pedestrians. James C is advancing the fear argument without any regard to engineering realities and car-bike collision statistics. He claims that same-direction motor traffic is extremely dangerous because every overtaking could be a car-bike collision. He also claims that intersections can be made safer by “separat[ing] bikes and cars in time and/or require cars to slow down.” In statistical fact, motorists overtaking cyclists is a rare type of car-bike collision, whereas the predominant types involve turning and crossing movements. The trouble is that taking actions to make safer the safest part of motorist-cyclist interaction increases the number and difficulty of what are already the most dangerous parts of that interaction. Recognition of that problem leads to implementing additional safety features, not to reduce car-bike collisions but merely to head off the additional car-bike collision hazards that have been designed into the system by trying to make the safest part even safer. John Forester thinks infrastructure advocates are only concerned about overtaking. It’s not just overtaking that can be dangerous. Alcohol is involved in many car crashes. I can be taking the lane in all its glory, wearing a bright vest and helmet, and still get rammed by a drunk/inattentive driver. Don’t try to downplay the fact that many people are killed due to drunk drivers. That is far less likely if cars and bikes are physically separated. Why? Because most time spent driving is not spent making turns or entering/exiting a driveway. Most time spent driving is spent moving forward. If I can remove myself from the primary action of a drunk driver (which is moving forward at any given moment), I reduce exposure and therefore am safer. If I show you a mile segment of street with no driveways and no intersections, are you willing to concede that a quality cycle track is safer than “taking the lane?” Your concerns about intersections would be non-existent, yes? While turning and crossing movements are dangerous, we should address them should we not? I think where arguing with you falls apart is that you cannot seem to comprehend the engineering fact that intersections can be made safer than they are in their “default” setting. Driveways are dangerous whether or not there is bicycle infrastructure. Implementing at cycle track does not make a driveway more dangerous. The vehicular cycling belief is that by reducing the number of potential motor vehicle conflicts involving right-turns, parked vehicle doors and driveways the overall safety of cycling on major streets is reduced. While it is true that cycling where few of those conflicts would occur decreases the odds of them happening, there is no data that points towards cycling in front of fast moving motor vehicles creating less risk of serious injury or fatalities for the cyclist. Motor vehicles making a right turn or using driveways tend to be moving slower than motor vehicles vehicles turning left or moving straight. A greater difference in speed between motor vehicles and cyclists in a collision would tend to produce more serious injuries and fatalities for the cyclist. Police collision reports for motor vehicle/cyclist collisions on streets in the city of Los Angeles do not indicate whether a cyclist was directly in front of where the motorist who hit them was sitting, in the middle of the motor vehicle lane or traveling close to the curb or parked vehicle. Although its obvious that if a cyclist hits a parked vehicle they were likely traveling close to the parked vehicle just before that occurred. Lack of data indicating the number of motor vehicle involved collisions with vehicular cycling does not therefore mean that vehicular cycling is safer than not riding directly in front of moving motor vehicles. The city of Los Angeles had two periods of time in the last ten years where there was a large increase in the number of bicycle commuters. One of those increases came about without a significant change in the miles of bike lanes installed and the other happened after a major increase in the miles of bike lanes. Comparing those two periods of time can give an indication of the effects of installing bike lanes for both increasing bicycle commuting and the number of reported bicycle collisions. According to the Census Bureau household surveys of residents of the city of LA, bicycle commuting increased 56% in the years 2008 through 2009, a likely result of gasoline prices rising sharply in 2008. Bicycle commuting rose 31% in 2008 and 6% in 2009. A sharp drop in gasoline prices in 2009 did not stop the number of bicycle commuters from increasing overall for the year. Bicycle collisions reported by the LAPD rose 46% during that period of time, 18% in 2008 and 24.3% in 2009. There were probably no more than 8-10 miles of bike lanes installed per fiscal year during that time period. Census Survey results in the midst of the recession in 2010 showed a estimated drop in bicycle commuting of 7%. Yet, bicycle collisions reported by the LAPD rose 9.9%. With a new bike plan about to be approved, the miles of bike lanes installed in fiscal year 2011 rose to 19.7 miles. There was a 7% increase in bicycle commuting (probably at least partially due to the economy starting to recover from the recession) and a 6.5% increase in bicycle collisions reported by the LAPD. During fiscal years 2012 through 2014 there were 190 miles of bike lanes installed, 50 miles in FY12, 101 miles in FY13 and 40 miles in FY14. Bicycle commuting fell 4% in calendar year 2012 (it takes a while for people to switch to mainly bicycling to work). Bicycle collisions reported by the LAPD rose 7.1%. In 2013 bicycle commuting increased 21% and bicycle boarding’s at Metro rail stations rose 42%. Bicycle collisions reported by the LAPD increased 0.6%. For 2014 bicycle commuting rose 9% and bicycle collisions reported by the LAPD dropped 5.5%. No commuting data is available yet for 2015 and the collision data is only complete for the first six months. The first six months of collisions reported by the LAPD shows a 11% increase in total collisions, a 6% increase in pedestrian involved collisions and a 6% drop in bicycle involved collisions. This collision and bicycle commuting data indicates a strong correlation for increasing bicycle commuting and a lower rate of bicycle involved collisions with motor vehicles after bike lanes are installed. As W. Edwards Deming once said: Trust in God, everyone else bring data. Vehicular Cycling is based on beliefs that are not supported by data. There’s data here that allows you to compare fatalities from behind (23.4% of all fatalities — mostly narrow/rural/night, but 7% remain after those are excluded) with fatalities from sidewalk riding (0%) and wrong-way riding (4.8%). It’s an old study, of course. Guess who cites it in their book to support their claims (p. 157 of the 1st MIT Press Edition) about the right way to cycle. Only 2% of American car-bike collisions are fatal. The fatal collisions exhibit an entirely different epidemiological patter than do the 98%. It is statistically incorrect to base one’s conclusions on a subject to a very minor proportion of events that are known to be epidemiologically deviant from the others. That would be a sensible way to approach the stats if someone weighted death as no worse than a broken bone or a bad case of road rash. I am amused that you would contort your argument this much in defense of VC — “safer, except for death, which we ignore because it is rare”. I didn’t catch that in any of my readings of Effective Cycling — will there be another printing? Hindman presents a bunch of statistics that are irrelevant to his argument, and then claims that “Vehicular Cycling is based on beliefs that are not supported by data.” The only significant statistical study of American car-bike collisions was done by Cross some forty years ago. Two pseudo-replications since have shown that the same pattern has persisted from Cross’s time to the recent present. Taken crudely, the Cross statistics show that less than 5% of car-bike collisions occur when straight motorists overtake straight cyclists, and that 95% of car-bike collisions involve turning and crossing movements by one or both parties. Logically, most safety effort should be devoted to reducing the collisions from turning and crossing movements. However, Motordom desires, and the fear that it has created demands, that the safety effort be devoted to reducing the lesser hazard. Unfortunately, the designs and policies intended to reduce the lesser hazard end up increasing the already great majority, the 95%, of car-bike collisions. The statistics of car-bike collisions support vehicular cycling over cyclist-inferiority bikeway cycling. The rules of the road for drivers of vehicles have been worked over by experience so that they produce reasonable safe vehicular travel. Vehicular cycling is cycling while obeying those rules, while cyclist-inferiority bikeway cycling contradicts those rules. It is irrational to claim that disobeying the rules of the road is safer than obeying them. Those cyclists who have switched from cyclist-inferiority cycling to vehicular cycling practically universally claim that the frequency with which they get involved in possibly dangerous traffic conflicts with motorists is greatly reduced. That is reasonable, since both parties are then operating by the same rules, rather than by different and conflicting rules. These are the data that support vehicular cycling. It isn’t just the US, Canada, UK and Australia and New Zealand where this effect can be seen. In China, it used to be one of the cycling nations in the world. Now their freeway system is the longest in the world and congestion and smog plagues many cities, and cycling has declined rapidly within a generation. Everywhere else motor vehicles have been introduced and took over as the dominant form of transport, cycling declines rapidly. The Netherlands holds out because it makes cycling easier by making it quicker to park bicycles, having more direct routes than cars, separate paths away from cars that include being safe at intersections, signalized or not, or 60 km/h rural or 30 km/h urban low volume shared streets and having certain restrictions on cars. What’s your point? You complain that people prefer private cars for urban travel. Well, that’s a fact. My argument is that in such societies, specifically in the USA, where I cycled for decades, vehicular cycling is the method of cycling that is best for cyclists. You add the irrelevant argument that The Netherlands is not such a society. Well, I have never claimed anything different. You argue that the Netherlands has been made different because it has facilities that favor cyclists and restrict motor travel. In that I disagree about the cause. You fail to state that the Netherlands is able to have such a cycling-favorable and motoring-restrictive system because, long before motor travel became popular there, its cities were medieval walking cities, to which cycling was added about 1920. The people who lived there, and who operated the cities in which they lived, had a pattern of operation that suited walking distances. If that had not been so, the present Dutch pattern would not now exist. When motoring started to become popular, about 1962, the influx of cars demonstrated that those cities, and the operating patterns of those who lived in them, were completely unsuited to motor travel. There was a revolt against motoring, in consequence of which the present system developed. There is no car-bike collision data of vehicular cycling. Your simply assuming that by changing the position of the cyclist on a road that the rate of serious injuries and fatalities for cycling will decrease. Having a cyclist ride in front of high speed motor vehicle traffic introduces potential conflicts that are less likely to exist when riding in bike lanes, cycle tracks or bike paths. The statistics in the Cross study is of cyclists mainly riding to the right of motorists and not directly in front of them. Its pure conjecture to conclude that it would be safer to ride in front of the moving vehicles. There is no motor vehicle/cyclist collision data involving vehicular cycling to make a claim of increased safety by riding a bicycle in front of fast moving motor vehicles on major streets. There were 33,000 motor vehicle involved collisions reported by the Los Angeles police department in 2014. Most of these collisions involved injuries. Believing that its safer to get directly in front of the direction of travel of these motor vehicles when they were involved in these collisions would somehow prevent a cyclist from being injured does not stand up to scrutiny. The number of motor vehicle collisions involving fender benders that are not usually reported by the LAPD is likely to have been much greater than those 33,000 collisions that were reported. A motor vehicle hitting a cyclist is likely to involve physical injury to the cyclist. Motorists make mistakes. I have been hit twice from behind while riding a bicycle directly in front of cars. Both times the motorist made an error. If I had not been directly in front of these motorists then those collisions would not have occurred. Generally, human beings do not want to put themselves in situations while cycling where motor vehicles traveling at high speeds have the opportunity to hit them. They don’t need to be told this, nor does it necessarily involve fear. Its rational to understand that if you are not directly in the path of motor vehicles moving at high rates of speed while cycling that the likelihood of being hit by one that is traveling at a high rate of speed is diminished. Hindman is advancing the hypothesis that the lane-occupying part of vehicular cycling is so dangerous that its danger outweighs all the other safety parts of vehicular cycling. He also advocates that bike lanes, cycle tracks, and bike paths make cycling much safer. Note that Hindman advances no data to support his hypothesis. Hindman claims that bike lanes make cycling much safer. Motordom invented that claim forty years ago, and in all that time no supporting evidence has been produced, either by engineering analysis or by empirical test. Indeed, engineering analysis suggests that bike lanes, with their policies, are more likely to increase car-bike collisions than decrease them. Hindman claims that urban sidepaths make cycling much safer. Engineering analysis demonstrates that urban sidepaths greatly increase both the number of conflict points between motor and bicycle traffic, and the difficulty of acting safely in those situations. Hindman claims that bicycle paths make cycling much safer. The empiric evidence that exists says that they do not. They produce a different mix of crash types, but more of them. By and large, if a bike path attracts sufficient traffic to be justified, its traffic makes it very dangerous for travel at any speed above low. On the contrary, such evidence as exists shows that those cyclists who are most likely to use vehicular cycling have crash rates only 25% of the rates of the general cycling public. And those cyclists who have switched from cyclist-inferiority to vehicular cycling report a dramatic reduction in situations involving almost collisions with motor vehicles, in which the cyclist has to take significant avoidance action. Perhaps you are right that there is nothing useful here for vehicular cyclists. But such cyclists are very few in number. Cycling mode share in many parts of the world, including North America, has failed to increase substantially with the vehicular cycling policies. It is only since we have begun to provide dedicated facilities for cyclists that mode share is finally starting to increase. Only now are we starting to have facilities that are safe for all ages and skill levels, including young children and grandmothers. You cannot ask a child to behave like a vehicle! You claim that: “Cycling mode share … including North America … has failed to increase substantially with the vehicular cycling policies.” You don’t know what you are talking about. Since about 1925, the USA, driven by its Motordom, has continually used social and legal means to stamp out vehicular cycling as far as possible. Vehicular cycling survives only because some cyclists have found it much better and safer than the ways that government and society attempt to force us to cycle. It is because of this long-continued war against Motordom and motoring society that vehicular cycling, as exemplified in “Effective Cycling” and in “Bicycle Transportation”, has achieved its confrontational nature. You claim “You cannot ask a child to behave like a vehicle!” Again, you don’t know what you are talking about. Nobody has asked a child to behave like a vehicle; that’s one of your anti-vehicular cycling myths. I can’t help it if your opposition to vehicular cycling glows so brightly. Vehicular cycling is obeying the rules of the road for drivers of vehicles. Vehicular cyclists are expected to act like drivers, not like vehicles. And the rules of the road are just as easy to learn as the rules for association football, easier than the rules for cricket. It has been proved that children as young as eight years can, with reasonable training, obey the rules sufficiently well for two-lane roads at reasonable urban speeds. You claim that your facilities (just what they are you don’t say) are “safe … for … grandmothers.” You are claiming that “grandmothers” are so far gone in senile dementia that they have lost the ability to understand the rules of the road. I simply say that any person so demented must not be allowed out alone, anywhere, and whose home must be so arranged to eliminate the probability of dangerous conditions. It is shameful that I have to spend my time trying to keep this typical nonsense out of circulation, simply to protect us all from its effects. Hi John, thanks for your reply. You seem to think I know nothing about vehicular cycling. In fact, I have read extensively on it and taken courses on it. I have even thought courses to teach people how to follow the rules of the road. But and I have commuted in traffic for several decades, year round, and never stopped by cold or snow or rain. Further, I have used my bicycle for transportation in cities around the world: buenos Aires, Rio de Janeiro, London, Dublin, Madrid, Beijing, and many others. In all of those locations, I saw very few people cycling, with the exception of Beijing. Why? Most people who ride bicycles are scared of being killed by Motor Vehicles. Recently most of the cities have begun to create separated cycle tracks, and ridership is taking off with all ages and both sexes. Demonstrably, this is a more successful approach since it answers the main concern of would-be cyclists: the need for safety. It has nothing to do with being Dutch. Even I feel more relaxed when I am on a separated route. So, the majority of people will ride only like traffic-incompetent frightened rabbits. That’s dangerous on normal roads They suffer the consequences and demand segregation. However, that provides no justification for government prohibiting to cyclists the right to obey, and the safety of obeying, the rules of the road for drivers of vehicles, just because motorists believe that subservient cyclists make motoring more convenient. Let the frightened ones ride as they will, with whatever facilities they can persuade government to provide, but to have bicycle transportation continue the government ought to allow those cyclists who so choose to obey the rules of the road for drivers of vehicles to do so. American government, driven by American Motordom, has for seventy years had laws to prohibit cyclists from obeying the rules of the road for drivers of vehicles, just to make motoring more convenient. Those laws ought to be repealed, so that cyclists may regain the right to operate safely and usefully in accordance with the rules of the road. I agree with your observation about historical context. Paved roads were initially introduced to make it easier to get around on bicycles. Then along came cars, and ever since then bicycles have been increasingly squeezed off the roads. I would suggest we also both agree that the ultimate goal is to get more people riding bicycles. Having said that, I believe there are many ways to achieve that, and at least as an interim step it can be helpful to provide secondary segregated facilities. I still think focusing on enemies and war against an undesesirable situation will give you exactly what you focus on: an undesirable situation and a war. In my opinion it is much more effective to focus on solutions and remedies. Goes for cycling, goes for just about everything else. But some people just do well by sustaining conflict. I can’t believe you are still banging your tired old gong, John. Your ideas, nobly intended, did emphatically fail us. How would you expect me to bike with my 5 year old to the downtown library? In car traffic? Seriously? Give it up, John. The world has moved on. Wow, a comment from the famous/infamous John Forester, the vehicular champion of the US. Now over 85 years old. If he could have had his say over Dutch cycle policies in the 70s, we would probably have little cycling here. I wonder if he still uses his bike? In the Netherlands its not unusual to see older people use their bikes and feel save and healthy. You don’t know what I would have recommended if faced with the Dutch problem of 1970. You don’t know, because I don’t know either. As I have repeatedly written, the Dutch cycling problem is theirs to solve in their own way. And, I repeat, I don’t give a damn how you do it. I just want to protect American (USA) cyclists from the intrusion of Dutch ways that don’t fit our situation. You wonder if I still cycle, remarking that “In the Netherlands its not unusual to see older people use their bikes and feel save and healthy.” Again, your remark shows how little you understand about your subject. I still have the intelligence to know how to obey the rules of the road; loss of that understanding is not my problem. My problem is that I have one bad knee and two bad shoulders, so that cycling, even under conditions simulating Dutch conditions, is so painful that I can’t stand it for more than a few minutes. That pain is why I no longer cycle, not some failure to understand the rules of the road. I bought a new cycle, a very nice cycle with a mixte frame, that I hoped would ameliorate my difficulties, but it didn’t. So I passed that cycle on to my son. Ah, John, the point you’re missing is that most roads are carefully designed for vehicles that are 2m wide, and that weigh half a ton, and that can travel up to 70mph, and accelerate to that speed in a few seconds, and that require no effort on the part of the driver to accelerate and decelerate and that can travel very close to each other at speeds up to 30mph without significant risk to their occupants. When one tries to use a vehicle that can only travel at 20mph for sustained periods, and that’s 50cm wide but needs at least a 1m passing distance for safety, and that takes some effort on the part of the occupant to accelerate, it’s very difficult to use that vehicle safely and effectively. Better to use it on roads that are specifically designed for that vehicle – ie cycle tracks. If only having “the intelligence to know how to obey the rules of the road” were sufficient to avoid ever being in a collision (as a car driver, cyclist or pedestrian)! Humans are not rule-following automata: we have lapses of attention, get distracted, and misjudge speeds and distances. And let’s not pretend that it’s always somebody else’s fault: we’ve all had our lucky, heart-stopping misses. People on foot or on bicycles do not come off well in a collision with a motor vehicle, especially if it’s travelling at 30mph/50kph or more. Segregating those people from motor vehicles improves safety. Simple as that. Mr Forrester, you may not “give a damn” how the Dutch or Danish make cycling safer, but their best practice clearly reduces deaths and serious injuries and encourages many more people, of all ages and abilities, to cycle. There’s no reason to slavishly copy a single road profile: infrastructure should always be adapted to the available space and local requirements (e.g. in hot countries, people outside of air-conditioned vehicles need lots of shade). But what I really don’t understand is this Dutch v vehicular cycling debate. No developed country has banned bicycles from any roads other than express/motorways. Confident cyclists who prize speed above safety can use the road; the rest can use the segregated/protected cycleways and junctions. Edward, there is a “Dutch” vs vehicular debate. When there is a separate bikepath, its not allowed to use the “car”road. You can’t have both. When done right, its safer and more pleasant for everbody. Here in the UK it’s not the case that cyclists have to use a segregated cycle path if there is one (even if some car drivers think they should). But I see now that some cycle paths in the Netherlands are compulsory. What determines that? The speed limit or width of the alternative road, or just the whim of a traffic engineer? Bert, I’m not sure that a segregated cycle path is necessarily “safer and more pleasant for _everybody_”: the reason there’s a debate here is that some people prefer the speed and directness of a main road; it’s not always possible to create a segregated cycle way that is as direct as the road and sufficiently wide to cater for all cycling speeds (from the unpredictable four-year-old to the 30mph speed demon). Banning vehicular cycling is just not necessary; we don’t stop people mountaineering, diving or riding horses (all dangerous activities), so why should we ban road/vehicular cycling (other than on express/motorways)? It’s an unhelpful distraction from the important task of creating safe and convenient cycling (and walking) infrastructure for the vast majority of people who do prize safety over speed. Edward, here in the Netherlands there is no “war beween bikes and cars”, but we don’t want cars in the bikepaths and we don’t want bikes in the “carroads”. The irritations start when you try to mix different types of traffic with different speeds. When we mix cars and bikes, in general there is little cartraffic. You say that you do not understand the controversy in the USA between vehicular cycling and imported Dutch practices. As you write, “No developed country has banned bicycles … ” Banning is not the only issue; being made subservient to motorists, a trespasser on “motorists’ roads”, being denied the right to obey the rules of the road, being required to ride dangerously, being declared to be a road hazard, all because motorists believe that that subservience will make motoring more convenient, that is the issue and it applies to almost all jurisdictions in the USA. And this has all been accomplished by greatly exaggerated fear. In order to ride safely and usefully, American cyclists have to defy government and society, both legally and emotionally. And now we have frightened and traffic-incompetent American cyclists (the product of America’s anti-cyclist oppression) saying we should add to our problems by importing a variety of Dutch practices interpreted by American society. That’s why this controversy exists in these discussions. Try a bike with a more upright riding style, and electric assist. You might find it does wonders for you, and will certainly get your weight off your shoulders. Get a Bakfiets and your son can ride you around. It will make the two of you look rather “Dutch”, so you better carry a sign “Against evil Dutch cycling policies!” while you’re in you bakkie. I was surprised to see a remark from Forester on this blog and at first this seemed not to be noticed. I don’t know how important Forester was for American biking. I know that Franklins influence on British cycling, according to many, has set back biking in Britain for decades. There was a strong following for vehicular biking in England, but many realized this resulted in a disaster. For the Dutch (Danish etc.) biking is part of our daily life. If men like Forester had had their way over here, cars would rule the roads. Its not about cultural differences, its about making the right choices. When you have reformed American traffic law and American society away from its anti-cyclist laws and policies, your comment might be worth considering. Until you have accomplished this Herculean task, just shut up. One more reason why the vehicular cycling hasn’t caught on: Its main proponent seems to be antagonistic and somewhat paranoid about the actions of government. People will choose to cycle more if they have fun doing it, and it’s a relaxing activity. Browbeating people is the wrong way to go. Of course cycling should be enjoyable, and, when cyclists are left alone, it is. But in the USA both the traffic laws and society’s attitude are against lawful, competent cycling in accordance with the rules of the road. My attitude toward governments’ cycling policy was gentle at first, but once I had experience in US cycling affairs I had to respond to governments’ and society’s anti-cycling nastiness. On the part of government, nothing but lies and cheating; on the part of society, nothing but disdain and humiliation, all because I stood up for the rights of cyclists to be considered legally and socially equal to motorists. So, Mr. Canadian, since much of Canadian traffic law mirrors that of the USA, had your jurisdiction have a law limiting cyclists to the edge of the roadway, and, if so, what has been the success of your gentle approach in getting it repealed? If your gentle approach achieves such successes, we all need to know how it is done. In these discussions, while I have received a plethora of advice that cannot apply to the situation of US cyclists, I have received not one word of sympathy for our plight, not one word of understanding. Well yes, in Canada as in the United States, most jurisdictions have legislation requiring bicycles to keep “as close to the right edge of the road as practicable”. This is not the same as “as close to the right edge as practical”, since it needs to take into account the cyclist’s own perception of his or her safety in avoiding road hazards such as the door zone. However, perhaps due to society’s values as you suggest, many drivers will not tolerate seeing a cyclist in front of them in the road for even a few seconds. Sadly, something happens to the minds of people when they get into a high-powered automobile, and many are not hesitant to use their extra perceived might to push aside vulnerable cyclists. Below is one cyclist’s experience with vehicular cycling on a commute home. Most of us find this extremely off-putting, and few women in particular will tolerate this kind of abuse. It’s easier to ask for separated cycling facilities than it is to ask for society to change. I an convinced that vehicular policies resulted in anti-cyclist sentiments and more anti-cyclist laws and policies. Cycling is not seen as convenient, easy, pleasant, good for health, environment, obesity combat etc.. In stead most vehicular bikers are a small group of men in lycra, that cardrivers hate. Maybe a bit black/ white, but vehicular biking is NOT the way to get a healthy bikecultur. You are so ignorant. American anti-cyclist laws and attitudes go far back before the invention of lycra, and were formed by the desire of Motordom to have the roadways for motorists alone. By 1925, Motordom had frightened pedestrians off the roadways and decided that it would then frighten cyclists off the roadways also. Motordom got cyclists declared a road hazard, and then, about 1940, started getting laws limiting their use of the roadway. Sure, they said for the safety of cyclists, but it was for the convenience of motorists. Motordom said, “Stay out of our way or you will be crushed!” and they got society to believe it and enforce it with anti-cyclist laws. And bicycle advocates then joined Motordom in denigrating lawful, competent cyclists. As a result of prohibiting cyclists from obeying the rules of the road for drivers of vehicles, Motordom turned cyclists into outlaws. I have several times reminded motoring organizations that since you turned cyclists into outlaws, you now have to suffer the effects of lawless cyclists. You’re a very rude man. Interesting, but I am concerned about making fietsstraaten part of 20 km/h zones. 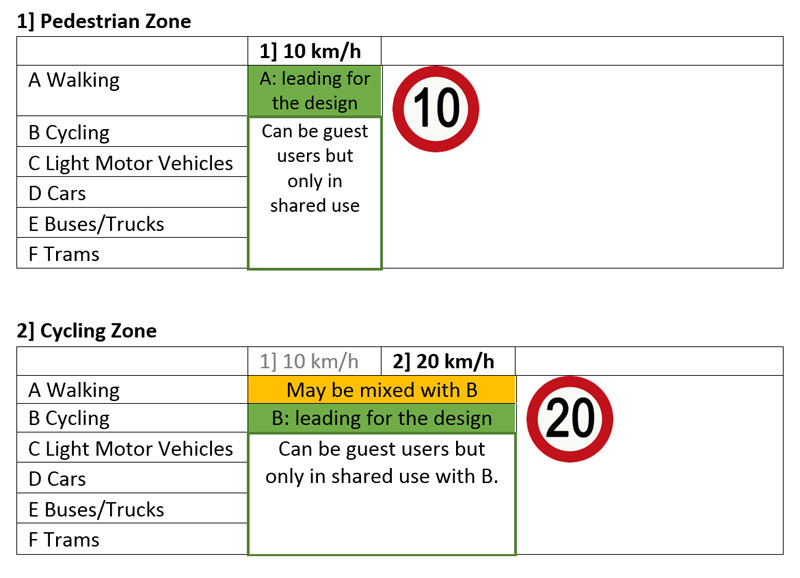 I think they’d do better in the LEV zone as 30 km/h routes, especially since they’re being used to connect across cities. I took a look at the full document. Even in the summary, it says multiple times that allowing heavier vehicles in a lighter zone is only a possible option based on local requirements, not the design goal. So a 20km zone would be designed for bikes, but might allow delivery vehicles in on one street to access shops as a guest. Or a resident to park his car. It’s to allow some flexibility. A 20km zone would be entirely designed for bikes. It’s just that banning all other vehicles in all situations isn’t realistic. I think it’s a interesting and sensible new design paradigm! And I think it is good it mandates lighter categories of transportation be separated on zones of vehicles two categories higher. And that there would be areas optimized for biking and walking above all else. I look forward to seeing where this goes. It’ll be interesting to see how this continues to develop. It seems to be quite a big change from current practice in many ways. I’m also curious to see what the Fietsberaad’s reactions are to these plans. Having just visited Utrecht last month, it would definitely be nice to not have to share the separated cycle paths with scooters any longer. If I recall, I actually saw more yellow license-plated scooters using those paths than the blue ones, to my surprise considering that the yellow ones are not allowed. The only thing that raises some doubts in me is the vagueness with the current details about the 4 types of zones, especially the middle 2. If not planned well, zone 2 could very well become a semi-zone 3 (as far as motor vehicle levels/usage). Hopefully this also wouldn’t convert the streets that are currently closed to motor vehicles to a zone 2, thereby allowing them in again. I agree we have to monitor this closely. Nice ideas can be watered down or abused as an excuse to promote a different agenda. But I think it’s primarily a good thing the discussion has started on this. The fact that riders of speeding mopeds are using our bike facilities illegally says something about the quality of the network. That they prefer those over the roadway is at the same time a great nuisance and a compliment, I think. What would be your opinions on mopeds be if they had a much harder to crack limiter and much more vigorous enforcement on remaining speeders and if they were all electric mopeds? Would that make them tolerable? If such a moped would become available, that would definitely solve the noise and exhaust issue. And if the limiter is near-impossible to remove, I guess that would also mostly solve the speed issue, although the mass of a moped is still considerably greater than even a dutch utility bicycle. But I wonder, who would want to spend all that money on something like that? An e-bike would already seem to be better option, given those limitations. The link from Utrechter is very surprising. It looked as if Amsterdam was about to become the first city to take such action, but didn’t seem to make further progress as of yet. I’m sure it’ll take a while for the majority of moped riders to stop using the cycle paths and realistically, you’re probably never going to get 100% compliance since mopeds can just as easily bypass most obstacles put in place for cars. Stairways without adequate or alternative ramps are the only things I can think of that would stop only mopeds and not most cyclists. But that will be a big improvement for cyclists. Bear in mind that riders of fast mopeds with yellow plates are not allowed on cycle paths in most municipalities already. Only the slower ones with blue plates are usually allowed. And Amsterdam wants those as well to ride on the carriageway. But in dense cycle traffic all scooters are a nuisance, because they’re too fast and a lot wider than bicycles. Even the electric ones. The only advantage these have is that they’re quiet and stench free. And yes, such a moped already exists. It’s a lot cheaper in ‘fuel’ consumption, too. But I suspect it’s a status thing, just like how a motorcycle that doesn’t roar is considered worthless. I cannot find the words for how much i dislike this. Firstly; for foreign visitors, Mark already said it, but i would like to repeat it; this is a PROPOSAL, by a think-thank. Not a new law, but something thought up by a private group! Secondly; that private group is the ANWB which stands for Algemeene Nederlandsche Wielrijders Bond, translated General Netherlands Cycling Federation. Which sounds good, but they are anything but that! They were founded in 1883 for pleasure riders, by the ones that then had the money to ride a vélocipède. When cars became more common they profiled themselves as a tourist federation. If you would read their magazine, you would see that they view the bike not as a utility vehicle but purely for leasurely pleasure. Riding in Drenthe as a tourist. But for cars they provide all kinds of services & they lobby for more highways, lowering of gasprices, that sort of things. In essence, they are now the greatest pro-car lobby & pro-car organization in the Netherlands. Ok, what’s in the proposal…. I think we can stop there, but they do not and come up with this whole ridiculous idea of making two seperate car groups. How would many people using cycle space be solved by making more car groups? Mopeds should be 50km/h with helmet & of the bike paths. E-bikes should only be powered when you pedale them yourself & restricted to 25km/h. I think 20km/h is a very reasonable speed. I’m retired and ride 25 to 30 miles per day on my “Tour of Fayetteville” using using pedestrian-free and virtually traffic-free streets and roads. I frequently reach speeds of 40 to 50km/h. However, on days when I’m too busy, I do a shorter ride in a local park which has a track and asphalt paths that I share with people. 20km/h or less is a very reasonable speed there. It keeps the walkers and joggers from getting uncomfortable and keeps me safer from the unexpected moves people make when not paying attention. With bicycle gearing, I can get an excellent cadence workout at 20km/h. Yeah, especially in the densely populated areas where these busy cyclepaths occur that speed is fine, and also just safest. I think it was Strava that tested average speeds in cities around the world recently among its users, and found that average speeds were highest in Amsterdam, with a speed of around 25 km/h. And only cycling enthusiasts and speed cyclists tend to use that app, most utilitarian cyclists in cities here go well below 20 km/h. For longer distances there are alot of great cycling paths in NL outside of the urban areas to go much faster on. I had a quick look at the larger ANWB report (with my poor Dutch). They seem to be suggesting that bike riders should be encouraged to use more of the street network. Great if the “minor” streets are converted to allow this, and I can see that as a option in a large city (though habit may be against it) or a major new development. But it might be difficult in a smaller place like Wageningen where, it seems to me, much that can be done, has been done – short of demolishing entire blocks : is that feasible? Whatever, any experiments will be very interesting. I do wonder if we’ll get another flurry of articles that misunderstand this initiative and predict the end of cycling paradise. A design speed like that is still bad. Something more like 40-50 km/h is probably best in urban areas, and 50-60 km/h in rural areas lets cyclists use all their energy efficiently. Can you imagine if you had to artificially constrain your speed down to just 15? You might be ageing, I’ve never asked how old you are, but at least most university students can go something like 30 km/h easily on an omafiets. Let’s not get over exited and just wait before complaining, right? I think we are going to work towards imporving things, not backwards. We’l keep an eye on it anyway. …what? Who cycles at those speeds? Did you make a typo? Even Tour de France cyclists only go around 40-45 km/h on the flats. Look up David Hembrow and his velo. Hey that rhymes. …and The Netherlands is pretty flat. I can sustain more than 30 km/h on a Dutch city bike and still get passed in the process by some ladies going home from shopping. That’s ridiculous, and very far from reality when it comes to the current situation in the Netherlands. First of all, safety and comfort is valued above efficient use of energy here, we’re not approaching cycling as a sport. Cyclists don’t go 40-50 in urban areas, certainly not here. Many urban areas in Netherlands are already 30 km zones for cars even. I really wonder how fast ebikes, recumbents and velomobiles fit into this scheme. On my intercity-commute my speed is between 30 and 50 (when the conditions allow it). Or are these zones meant for the inner city only? This is only about the city space, not about routes outside of the built-up area. E-bikes, recumbrents and velomobiles (provided they are under 35kgs) would fit in the cycling family. But remember, this is a proposal. There is nothing fixed yet. It is expecially those details, where to fit which vehicle and are the proposed categories workable in reality, that need to be tried and tested. Fascinating. It will be interesting to see how this is progressing in 10 years. I can’t help thinking that my home city will still be sitting and wonding why it is choking in motorised traffic. PS: Let us not forget that the traffic jam in Utrecht was caused by a traffic light, a construct existing to improve motor traffic flow and more or less unnecessary for bicycle traffic. Minimise the number of traffic lights and alter the way they are used to prioritise bicycle traffic. This will go a long way towards alleviating bicycle traffic jams. I mean, if we really do get serious, the problems in the photos you have shown in this post are not related to the lack of space for bike infra. In the Utrecht photo, there is plenty of space – the car road should be made one way, or the lanes narrowed significantly. And the school bicycle traffic jam is also quite related to the fact that a rather wide road runs next to it, including wide areas of grass limiting the width of the cycle track as well not creating a wider “magazine” near the intersection to allow more cyclists to cross at the same time. This report seems to exist to allow the private car into the cycle track, not the other way around. But I hope I am wrong. As I see it, this design approach tries to give road managers the tool to do exactly as you propose. Give that space now allocated to cars to people cycling instead. You are right that it is not a problem of available space, but it is a problem of how that space is allocated. I do not see it at all as allowing the private car into the cycle track, quite the opposite. It is about drasticly reducing the space reserved for cars in the city centres. Both photographs you showed of “bicycle traffic jams” had adjacent roads for cars with plenty of unused free space. Reallocating this space to bicycles would have eliminated the traffic jam. Yes, fix the bad signal also! Both situations have been resolved – the Utrecht one, as said was a bad signal (they were reacting to traffic, but the signalling was off so bicycles weren’t noticed, which caused problems when the road became very little or not at all used by cars). The Wageningen case has been resolved by changing the traffic lights as well, this time by increasing the green time for cyclists. I have to say I think this seems like a disaster waiting to happen. The whole plan sounds to me like something a bunch of engineers came up with, without taking any consideration to the real world. We tried that already with engineers designing cities and traffic in the 60’s and still today, that didn’t work so well. The idea that mixing of cars and bikes would work will require severe limitations on car speeds, something that even many Fietsstraat today do very poorly. And speed limitations for cars will impact bicycles as well. Also it is well known that drivers do not respect the speed limit and I find that this point was totally missed in the proposal. Mass is not the only risk factor, speed is also a big factor. A motorcycle can do quite a lot more damage than a moped. A 1.5m wide SMART car, while weighting about 700kgs can theoretically be designed to be half the weight (the motor only weighs 70kg). The SMART can drive at 140kmh, and can easily kill you whether it weighs 350kg or 700kr at that speed. In order for cycling to be a viable mode for all users, it should not just be safe, it should also feel safe, no? And limiting cyclists to 20kmh is also ridiculous. Will the limit be applied also on a downhill into a tunnel where cyclists prefer to build up some speed to get a boost when getting out of the tunnel? How can it be proven that the cyclist knew she was going faster than 20kmh? Will bicycles be required to have speedometers? I don’t disagree that bicycle routes can use a speed limit of some sort, but this speed limit should not limit the hard won energy that cyclists build up. Nor should it be a randomly chosen number just because it is a nice round number. Most cyclists easily reach 20kmh, and bursts of 25kmh are not unreasonable on straight roads with no wind. The limit should be somewhere in the 30s, so that e-bikes are controlled. And most racing bikers, while capable of higher speeds, can rarely sustain speeds above 30kmh for long. I’m sorry, but what you describe seems to me like simply giving up the idea of cycling as a viable means of transport in cities and just letting the private motor car into the bike infra. Maybe it’s a first draft or what not, but it’s a poor one even for a first draft. I’m disappointed and worried. Some car technicians are working on how to create limiters for cars that depend on where the car is. It remains to be seen as to whether this is going to be feasible or not, but if it is, it would remove the need for speed control devices other than the sign that gives the speed limit. And while we are at it, the moped limiters could be redesigned to be much harder to remove and an integral part of the machine. I share the same concerns with you in relation to the bicycle speed limit. Well, just as easily as snoorfietsen speed limiters are removed, so will the speed limit devices on cars. I think for the foreseeable future, physical barriers are the safest speed limit devices. That is not saying that we should not have digital speed limiters, but we should not trust them I think. According to the SVOW-Report R-2015-21 the mean speed on cycle path already is 20.5 km/h (Table 3 in https://www.swov.nl/rapport/R-2015-21.pdf ). Imposing a 20 km/h speed *limit* for all cyclists who do not want to ride next to cars is just silly. To me it seems the new approach is falling behind Sustainable Safety in that it only uses the two static variables weight and width to find solutions for a system whose very nature is a dynamic one, so it has to include speed and direction. Ignoring the dynamics is just silly as well. Speed and direction are indeed very important. It’s why I advocate for sustainable safety, not really this new approach. And also know how the mean was determined. 10 km/h cyclist plus a 30 km/h cyclist can get you an average of 20 km/h despite the fact that neither of them actually go at 20.
too many people are NOT cycling – excitingly enough people are now cycling that more space needs to be re-allocated from cars to walking and cycling. The only drawback is that racing cyclist will break the speed limit of 20 km/h. Many racing cyclists already use the street as an racing track, going as fast as they can; >30 km/h. And the police doesn’t have any means of enforcing the speed limit for racing cyclists. Although no explicit speed limits apply to cyclists, every person on/in a vehicle (“bestuurder” which includes cyclists) has to ride/drive in such a way that they can safely stop in the distance that the road is visible and free. Thus, the police does have a way to enforce such things if necessary. Still, it probably means the design speed of the cycle path. By design speed, I mean how fast it is intended to be capable of handling. Most cyclists go between 25 and 35 km/h, even on omafietsen. David Hembrow used to commute between Assen and Groningen by velomobile, and he could not have done so in an hour each way if he had to slow down so much for a 20 km/h bicycle path that is incapable of handling the 40-60 km/h speeds that a velo can create with similar effort to a town bike at 25-35. And he mostly made that commute next to roads with design speeds of 60 km/h, or in urban areas, 50 km/h, or on paths that are not next to roads at all. are you talking about police in the Netherlands being able to enforce the speed limit, or police in other countries? Here in Canada, in my city, Calgary, We occasionally have bylaw officers hiding in the bushes along the pathway system waiting to give a speeding ticket to a cyclist going faster than 20 km an hour, which is the posted speed limit. It is an odd situation, since there is no legal requirement for a bike to have a speedometer mounted on it. In practice, tickets will not be issued unless you are going substantially faster than the speed limit. Bus lanes (and in theory truck lanes) could also be considered to have their own space. Especially in areas like Rotterdam and Utrecht where there are lots of dedicated bus lanes for buses. I created a theory for a new neighbourhood, how it would be developed and which roads do what at what speed. I created a specific truck access road where trucks have their own 30 km/h access roadway to get to the commercial centre, and because it was too direct, cars are generally prohibited via electronic bollards. I also point out that the car zone means 50 km/h or more. There are of course 70 km/h arterials in cities too. Lots of dedicated bus lanes in Rotterdam? Where? Maybe I was thinking about Amsterdam, but I do see a lot of bus lanes in the Netherlands. Almere was built around them practically. Again, why are there so many thumbs down on my comment? Ah yikes! A 20 km/h limit on the cycling zone? That just means that the cycleways would be made of lower quality, less wide and doesn’t allow people with things like velomobiles to go longer distances quickly. And most people ride above 20 km/h. Who will be left on the cycleway? You keep posting that most people are going over 20 km/h. That’s definitely not my experience in Rotterdam. Most people will be around 15km/h. How wide are lanes for motor vehicles (and in the 30 and 60 km/h zones, the roadway) for the different kinds of streets? I use myself 3.5 metres when I propose cross sections for motorways and roads similar in function to autowegs, 3.3 for 70 and 80 km/h roads, 3-3.2 metres for main arterial roadways at 50 km/h (are 60 km/h arterials known in the Netherlands and if so, what is their application? ), and 2.8-3 metres for 50 km/h ordinary distributors, and 1.9-2.1 metre wide parking bays for cars and light goods vehicles up to 3500 kilograms (why don’t we say 3.5 Mg?). I would like to know how this works so my city can be hopefully persuaded to build narrower lanes. Our roads are often built in newer areas with 2.5 metre wide parking lanes, 3.2-4 metre wide collector and access road lanes at 50 km/h, and 3.5-4.5 metre wide lanes on mostly 60 km/h arterial roads. I hope that bike lane Nazi joke I shared is OK humour to the Dutch, given things like the hunger winter, Anne Frank, etc. How child do parents feel that children can walk around at least and at some point bike alone, at least not too far from home, so that a small child can walk (or bike!) to the store to buy a popsicle, ice lolly, whatever you call it Mark, on their own? If you had children, could they do this? In North America there is a huge stigma against this, parents might be arrested for child neglect or abuse, or both. Television cartoons called GI Joes often have public service announcements at the end with a message, one of the popular ones being “Stranger danger”. Does this sentiment exist in the Netherlands in one way or another? Also, when are children often considered to be capable of cycling for short (up to maybe 1-3 km), then longer, maybe up to 5 km, and long journeys on their own and when can they walk on their own for similar journeys? Ever heard of the phrase “Anti bicycle nazi”? This video makes that literal: https://www.youtube.com/watch?v=0C7AYsfB_dM. This entry was posted on 26 January 2016 by Bicycle Dutch in Original posts and tagged car-free, cycle paths, cycle streets (Fietsstraat), infrastructure, urban planning.